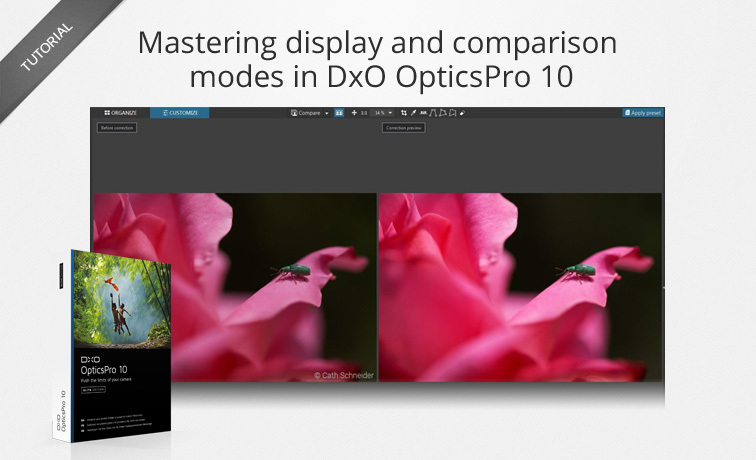 In this tutorial, we will show you the different display and comparison modes in DxO OpticsPro 10 and how you can best use them in your different stages of development. Whether you are in the Organize tab or the Customize tab, the toolbar offers you different display and comparison modes. The first two tools are the comparison mode tools, which will be explained in the following section. displays the image at its real size (100%). To pass directly from one to the other (that is, pass from a display that is adapted to the window size to one at the real size, or vice-versa), you can also double-click on the photo; this is particularly practical for returning to one or the other display sizes when you are using an intermediate zoom level. 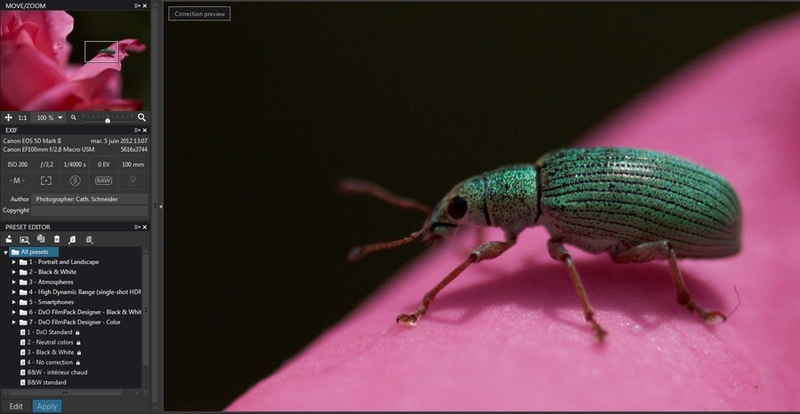 When in zoom mode greater than the size of your window, click on the photo to move the visible area of the image. Finally, the last button gives you access to various predefined zoom levels: click on the arrow to display them. By clicking directly on the value, you can choose a custom zoom level between 1 and 1600%. 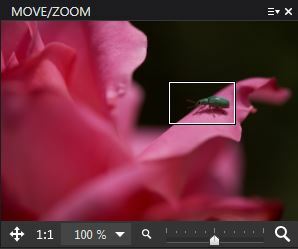 But it is more efficient to choose a suitable zoom level by using the mouse wheel (for Mac OS, use CMD + scrolling action). It may happen that you will need to perform several actions while you are in zoom mode on areas of your photo that are not close to one another, as in the case when, for example, you “clean” the dust specks from your sensor or when you set the anchor points for the geometrical correction tools. When you zoom, as in the example below shown at its true size, the navigation pane in the left-side panel will indicate what part of the photo is displayed in the main pane and will show you your location within the full image. Click in the navigation pane to move the part of the photo displayed, either on the frame that you move while holding down the left mouse button, or by clicking on an area in the photo that you want to display directly. When tools such as the Dust tool or geometrical corrections are active, the actions of the mouse correspond to those offered by the tool; press on the Space bar (and keep holding it down) to make the Hand tool appear and thus access the moving and zoom features described above. 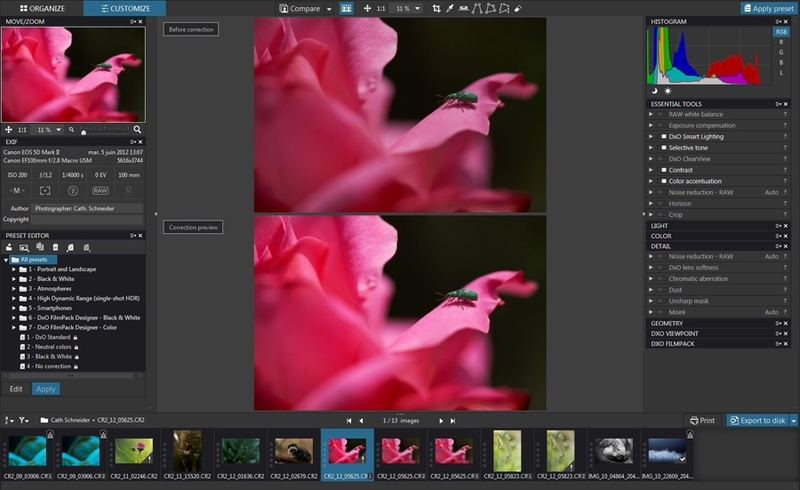 As part of its many automatisms, DxO OpticsPro instantly applies the DxO Standard preset as soon as you open a photo. This goes well beyond a “simple” demosaicing (in the case of a RAW file), and applies certain optical and geometric corrections as well. To obtain a photo that has been demosaiced but has not otherwise undergone default processing, choose the No Correction preset. 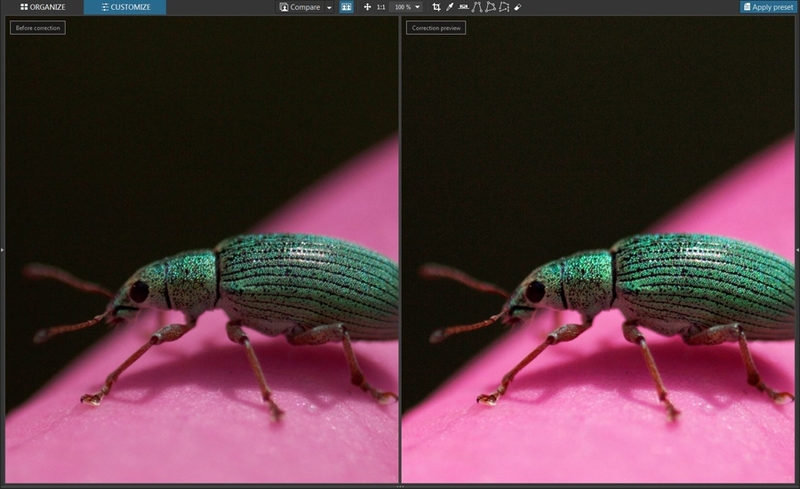 Left: The image after applying the No Correction preset. 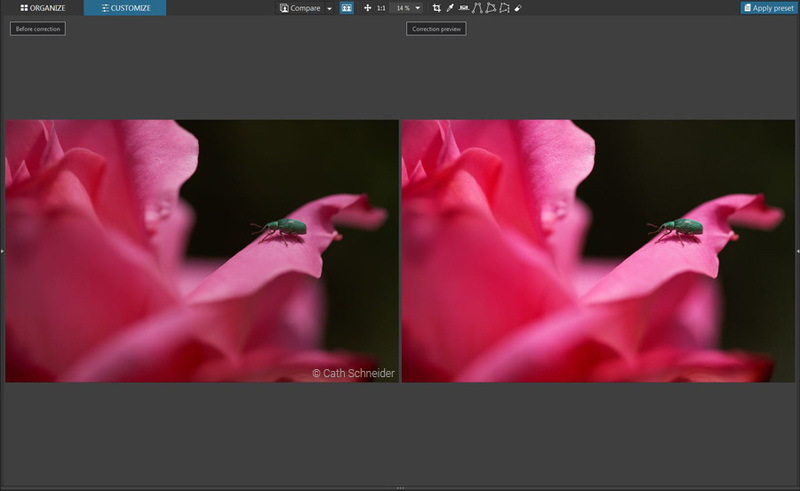 Right: The image after applying the DxO Standard preset. The default comparison mode lets you compare the version of your photo that you are working on with the uncorrected verion of your photo. button (under Windows, you can use the CTRL+D keyboard shortcut); keep pressing the button (or the shortcut key) to see the photo without correction. Select the arrow to the right of the Compare button to display the available options. By default, only the Before correction option is available. If you have created one or several virtual copies, you can use them as reference images. Under Windows, virtual copies must have already been processed (that is, exported) before they can be used as reference images. button, which displays the two versions of your photo (either one above the other, or side-by-side) while optimizing the space available in your window. To illustrate, the Landscape – Polarized postcard preset has been applied, letting you truly see the before and after differences. 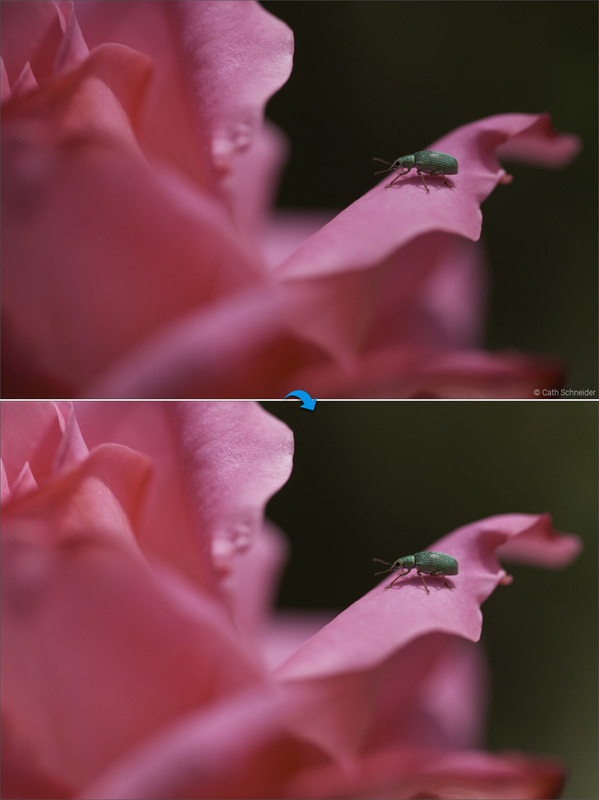 In this configuration, all of the zoom and moving features described above are active and the two photos are affected in a synchronized way, which is a practical way of comparing (for example) certain details in the image. To conclude this tutorial, we offer you a little tip about comparing two values within a specific setting. If, for example, you are having trouble deciding between two values of color temperature or microcontrast, it can nonetheless be a chore to create a virtual copy and to process it in order to compare the two different values. So instead, start by setting your slider on the first value, then position it to produce the second setting. You will then pass from one version to the other by using the keyboard shortcuts Undo (CTRL+Z / CMD+Z) and Redo (CTRL+Y / CMD+MAJ+Z), and then, with your fingers in place on the keyboard, you will be able to identify the areas to compare. This feature works regardless of the level of zoom, and you can adjust the zoom level without losing the ability to use the keyboard shortcuts.